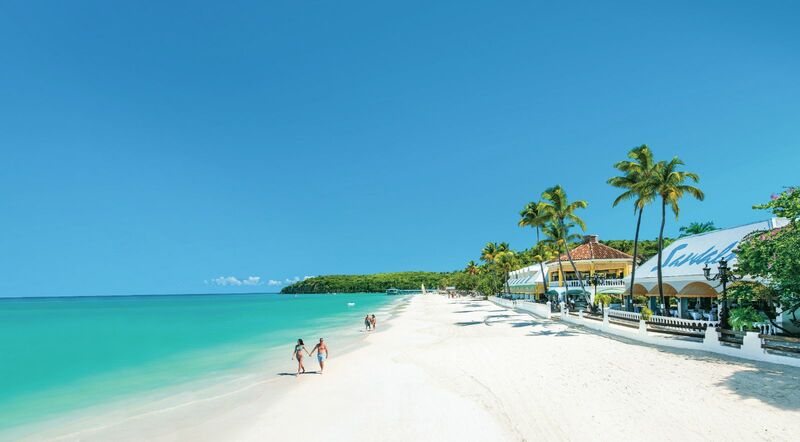 The award winning, luxury Sandals Grande Antigua Resort & Spa is the place to be on this aspirational island. 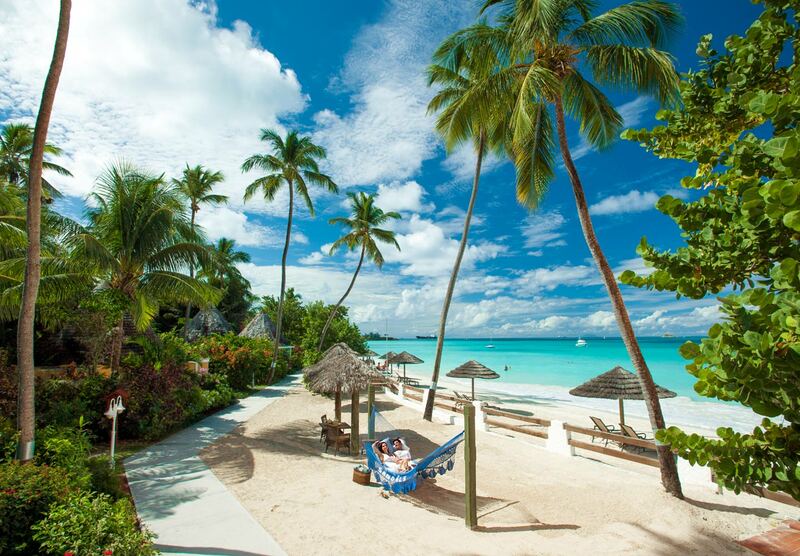 Welcome to the best beach, the best bars, the best restaurants. 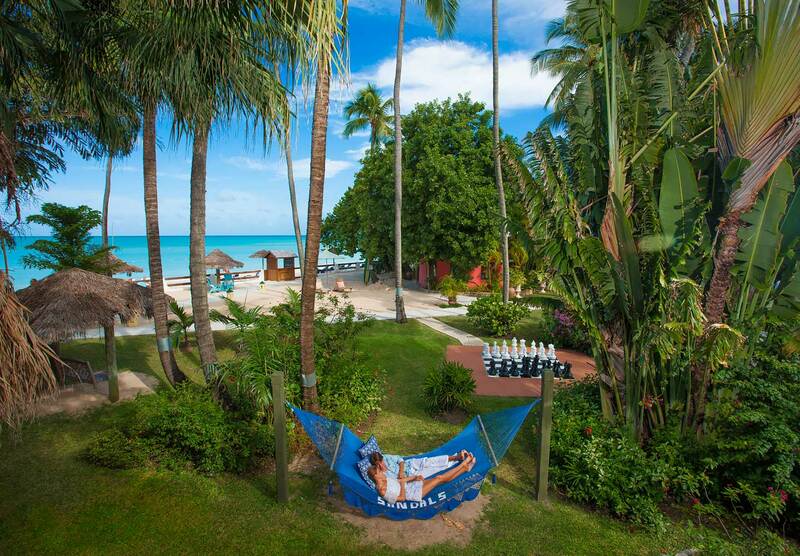 This delightful well-established hotel was taken over many years ago by the Luxury Included® brand of Sandals. They created an amazing all inclusive enclave with everything you could need. The resort is also just 15 minutes from a state of the art airport. Explore a quaint Caribbean Grove with lush, tropical gardens highlighted by brilliant bougainvillea. It enhances the luxurious suites, which incorporate Mediterranean inspired elements. 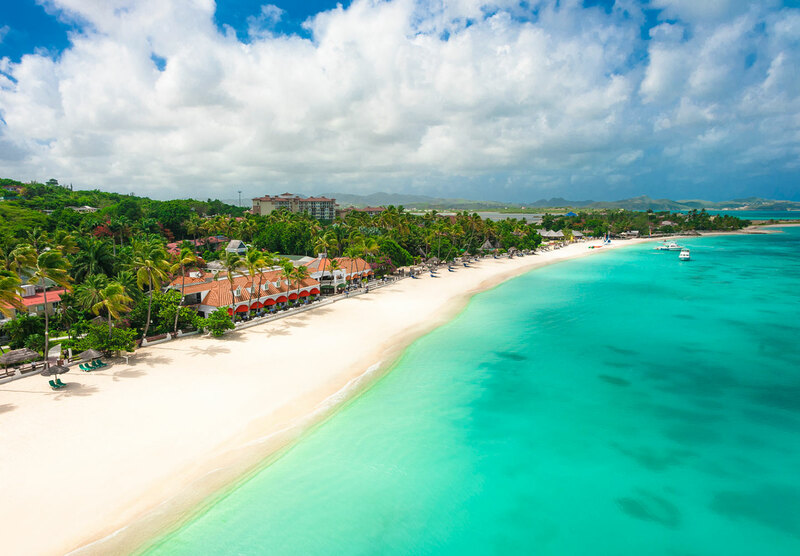 Rooms are nestled against a powdery white-sand beach makes for a resort to please all tastes. Beautiful, freshly landscaped gardens surround a fantastic pool, dotted with dazzling white gazebos. 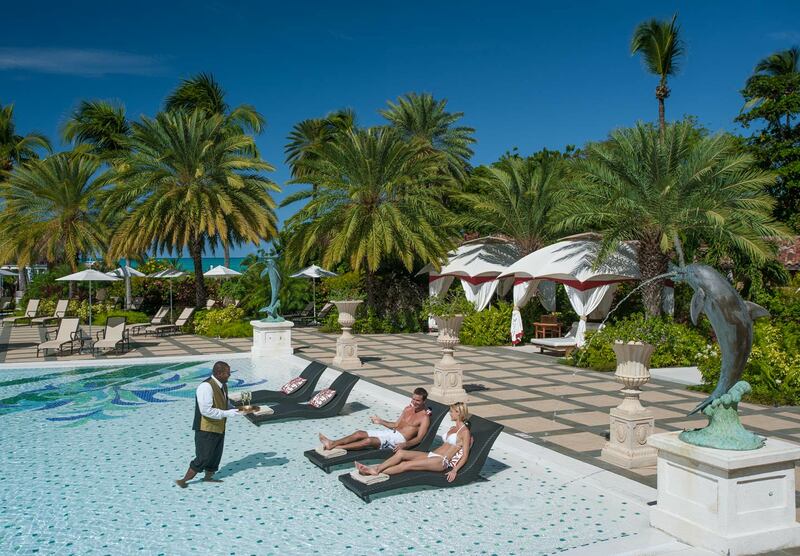 The new, refurbished Red Lane® Spa adds to the sense of luxury and romance permeating Sandals Grand Antigua Resort & Spa. There are 373 Rooms and suites in 25 categories. 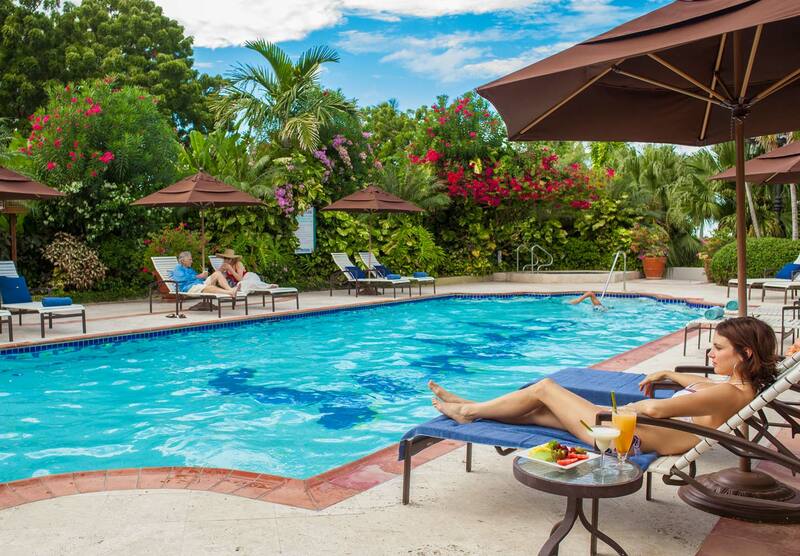 Accommodations range from one storey buildings with patios to Caribbean Honeymoon Butler Rondovals with Private Pools. Other options including the exotic Mediterranean Honeymoon Romeo & Juliet Ocean view Penthouse. There are also One Bedroom Butler Suites and Mediterranean One Bedroom Butler Villa Suites with Private Pools. 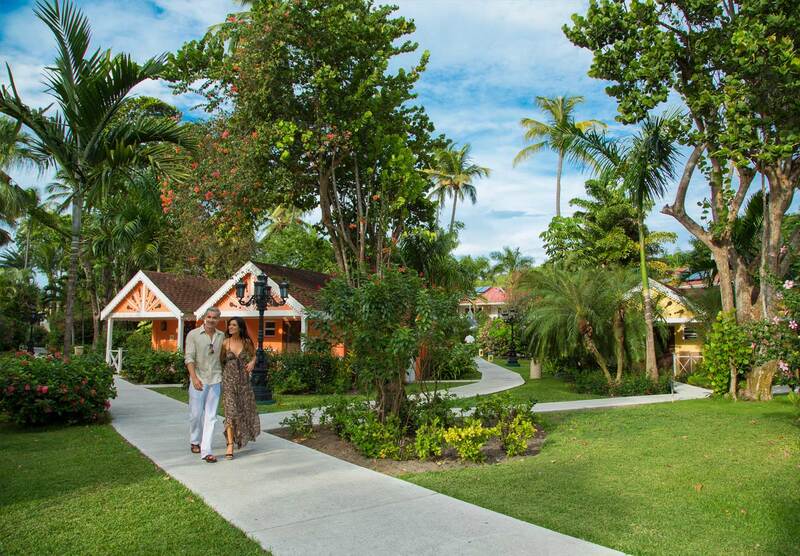 The Caribbean Grove: All accommodations have air-conditioning, a king-size mahogany four poster bed and ceiling fan. There is also an amenity kit, hair dryer, private bath and shower, iron and ironing board. You also have a telephone, safe, cable T.V, coffee/tea maker and iPod docking station. The Mediterranean Village: All accommodations have air-conditioning, a king-size mahogany four poster bed and ceiling fan. There is also an amenity kit, hair dryer, private bath and shower, iron and ironing board. You also have a telephone, safe, cable T.V, coffee/tea maker and iPod docking station. These suites also have exquisite Italian floor tiles, with custom designed mahogany furniture. The room features leather trunks and fabrics from Turkey, Italy and India. The bathrooms are fitted with Italian Giallo marble, custom his and her washbasins, the latest Kohler Purist bath and shower fixtures, whirlpools and overhead walk-in rain. All accommodations also offer concierge services. You will have the uncompromising attention of a personal butler, trained to the highest standards by the elite Guild of Professional English Butlers, and you will be pampered throughout your stay in extraordinary ways. 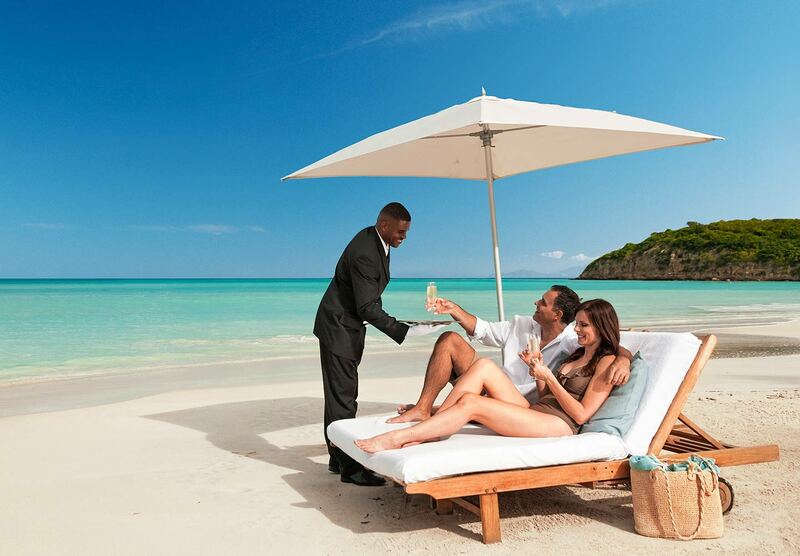 From unpacking and packing your luggage, attending to your wardrobe to serving a glorious repast on your terrace, a Sandals Suite, complete with your own personal butler, is the ultimate indulgence. 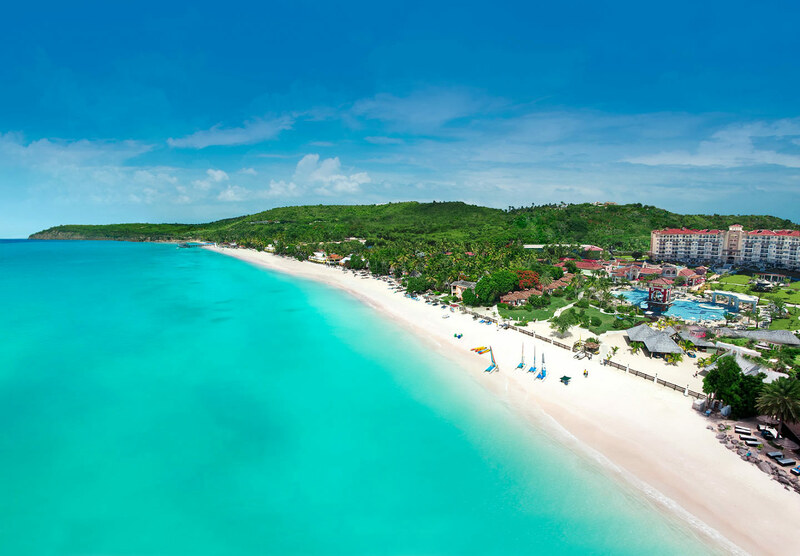 The Club Sandals Lounge is accessible 24 hours with Club Sandals Concierge available between the hours of 8:00am-10:00pm. 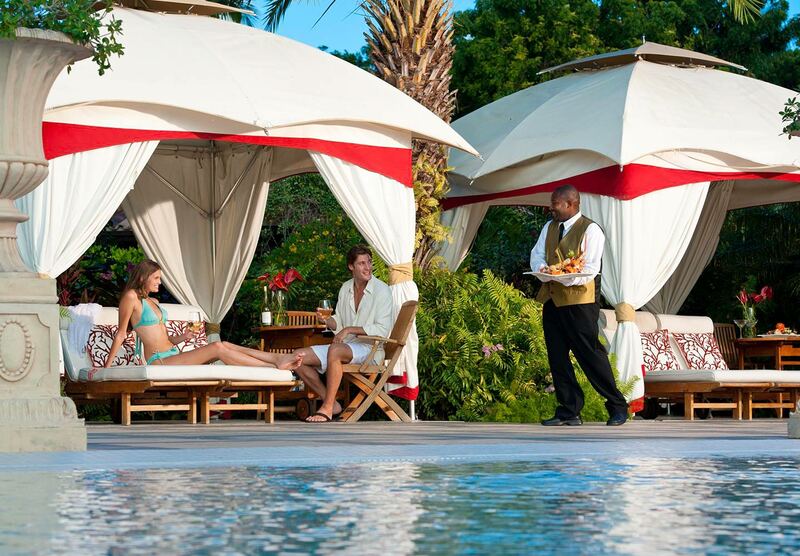 Your concierge can assist with reservations for spa, excursions, restaurants and just about anything you may need. 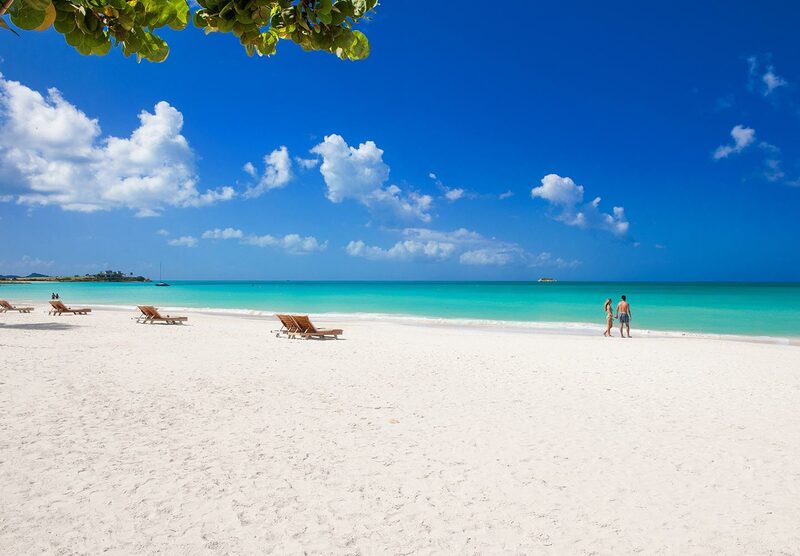 Preferred Club Sandals Lounge check-in with chilled towels and champagne. In-room/Suite and Lounge Bar stocked with alcohol and assorted soft drinks. ENTERTAINMENT: Nightly shows with live entertainment. Weddings – Your Wedding. Your Style. Combine your wedding and honeymoon with a WeddingMoon®. Sandals is excited to announce the addition of four (4) new colours to the WeddingMoons colour palette. The new colours are Radiant Red, Chocolate, Touch of Gold & Silver Dream. The WeddingMoons colour palette now provides fourteen distinct colours. These colour schemes apply to luxury linen, ribbons, elegant flower arrangements and accessories. Couples also have the opportunity to explore their options in virtual reality. You can watch your ideas come to life through Sandal’s innovative and interactive Wedding Designer. Guests who qualify for the free Beautiful Beginnings wedding (a US$500 value), but would prefer the flexibility of customizing their wedding may do so. You can still benefit from a US$500 credit, which can be applied towards a customized ceremony & reception or to any pre-designed wedding theme. A state of the art conference facility awaits the corporate and group meeting planner at Sandals Grande Antigua Resort & Spa. The conference centre offers the following amenities to make your meeting a success: full air conditioning, versatile seating and set up arrangements, complete audio visual packages, coffee break, lunch and dining options and a dedicated sales staff to assist in your planning.